On July 7, a group of concerned residents and owners in the Downtown Markham area came together and organized the “Downtown Markham Ratepayers Association” (DMRA). Initially, DMRA will focus on putting a stop to the rezoning of a parcel of land at the corner of Enterprise Boulevard and Rouge Valley Drive West. 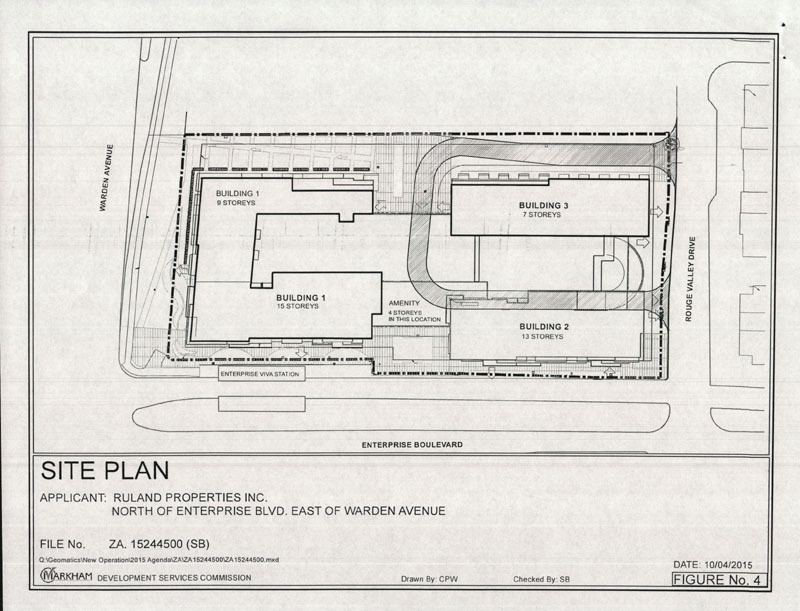 If the original official plan is allowed to change from “Commercial – Community Amenity Area” to “Mixed Use High Rise”, the changed zoning category will turn business use into apartment dwellings and retail-commercial uses and add over 500 units of apartments to a congested corner of our community. 1) Conduct workshop to make residents aware of the rezoning application and associated implications on traffic and safety issues. 2) Work with Markham City Council members to solicit their support to ensure a proper evaluation of this rezoning application and encourage them to turn it down. 3) Collect signatures in a petition to the City to turn down this rezoning application. Please visit the link below and participate. 4) Encourage residents to write to Markham City Council members to make them aware of our positions on this rezoning application. 5) Organize a presence of residents at the City’s Development Services Committee meetings and Council meetings whenever the rezoning application is brought out for discussions and voting. DMRA will be sending more information to our supporters in the near future. If you know of any friends and neighbours that may be affected by this rezoning application and want to help, get involved or stay informed, please contact us at our email address: DMRA.Markham@gmail.com . You can also reach one of our Executive (Jim) at 647-887-8121.